We are not sure what the condition of the roads like Cottonwood Canyon Road and Smoky Mountain Road are, because we heard (and as some places still show) that it has been raining here. Therefore, our first destination is the Bureau of Land Management, who has maps and knows every tree and every mud hole in the area. Unfortunately, they confirm our assumption: the dirt and sand roads are mostly muddy and impassible even for 4-wheel drives. We still quickly check the passage through the river in Big Water. Maybe we could have gotten through the river but we are sure that if there is that much water there will be a lot of mud on the road further on and that it’s not worth taking the risk and getting stuck. Next we pay a visit to the Paria Canyon Bureau and they confirm the same for the House Rock Road. She strongly discourages us from driving it. She says that we might get through but it wouldn’t be fun. We check it out ourselves and drive in about 5 miles and then turn around. It would take us forever to drive all the way through to HWY 89 (30 Miles) and we don’t feel like driving all day again. We drive back towards Page and shortly before the Glen Dam turn right into another sand road, which we thought we had taken before. But, we soon find out that we never drove it. This is the first real off-road test for our 4Runner and it turns out to be a real mountain goat. 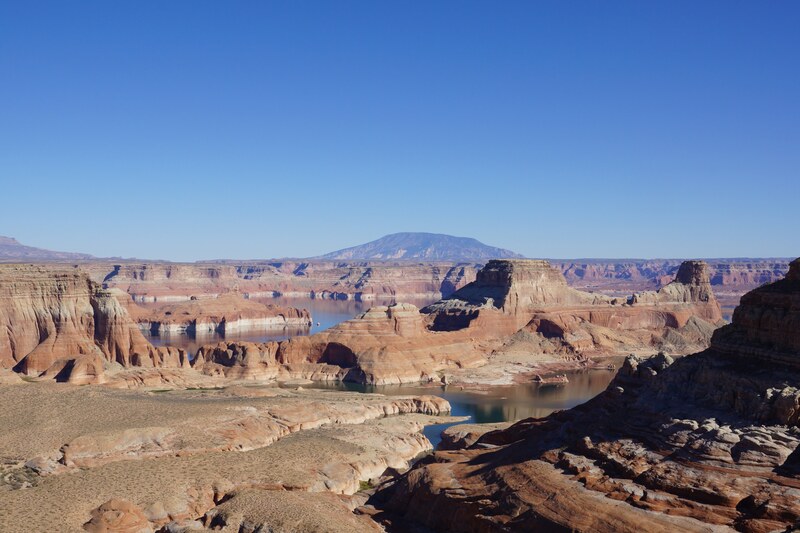 We arrive at a high plateau (Stud Horse Point) with lots of hoodoos and a brilliant view all the way to Lake Powell. We see lots of faces in all these rock formations up here – they are watching us (or over us?). Take a close look at the pictures, you might discover them them as well. Later we drive to Antelope Point and explore the area there a bit closer. The lake seems to have more water than last year. The water would be nice to go swimming but there are some clouds coming up and it is very windy. The landscape here is so completely different than up in the north and it takes us a while to get used to it again. But never the less we enjoy it and have a great day. We stay at the Motel 6 for the second night and have dinner again at the Glen Canyon Steak House, because we didn’t feel like having Italian or Mexican food and we saw yesterday that they have some other good choices on their menu.